The jewel that we present today is a pearl necklace and silver which summarizes unique old world charm and modern, retro and avant-garde style. Composed of elegant irregular pearls grown in fresh water and enriched with precious silver details, it is so finely crafted to evoke the harmony of the waves breaking on the shore. Can be worn in different ways, depending on the occasion, thanks to the presence of a central ring and two elements falling at the ends, both of silver, which make it adjustable at will, allowing to play with the imagination front of the mirror for fit perfectly to your dress. The brightness of the true stars of the necklace, pearls, will be reflected immediately on your face and your cleavage, giving from the first moment a bright light. The quality of the jewelry is also due to the way in which it is made: between each pearl was created a small knot, absolute guarantee of quality and richness of details. A marriage of art and style, perfectly united in one piece enviable unique features which you will wear with pride. 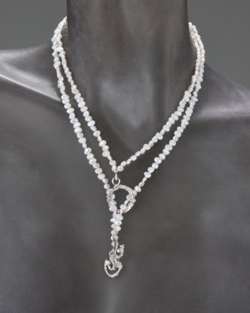 Perfect for important events, the pearl necklace is the mat for any occasion a special occasion, but also a simple out to dinner with friends. Long reach combined with a fresh summery dress is chic and ultra-feminine. Brings together mothers and daughters, as a unique jewel, classic, timeless: it is not a case where it is always on the neck of the most beautiful women in the world and has been handed down from generation to generation.